If you have been wondering why the hype about portable induction cooktop or why you even need one while you already own another stove top this article will be helpful. Well, several factors make them unique. First, the induction cooktops cool down almost immediately after removing the pot from the range. This makes them much friendlier especially when you have small kids around. And, they only get hot when an induction cookware on them. Again, them being portable means you can take them just anywhere, even camping, as long as you have electric outlets. They also make a great choice for people who have restricting spaces because they are small in size. In this article, we are going to focus on the best portable induction cooktops, pointing out the main features that make them unique and why they made it to this list. Note: Induction cooktops only react and heat up induction cookware/magnetic cookware, and it’s easy to find the cookware as they usually have a stamp stating “induction-capable” or “induction friendly.” E.g., cast iron skillets, enameled steel, stainless steel pots, etc. The Duxtop 9100MC 1800W Induction Cooktop, AKA Secura, features tons of cooking options which makes it very reliable and high selling. Its price is slightly higher than the Duxtop 8100MC, and that’s because it is built differently with more advanced features. First, it features a redesigned control panel in a way that it’s far from the heat plus it has 15 different power levels thus enabling you to cook various foods with a better control of the heat. And, it is also equipped with various safety features thus making it ideal even where there are little children. Its lightweight and compact design make it highly portable, and you can easily take it with you to various destinations provided you’ll have the required power outlet. The control panel is easy to use and the digital timer, 1-170 minutes, makes it versatile in terms of the type of foods that it can cook. The Duxtop 8100MC 1800W requires 110V/120V and 15Amp power connection to operate which is available in most standard homes. Installation after unpacking is easy and takes just a few minutes. Once plugged in any 120V power outlet, it will be ready to start cooking. It has 10 temperature ranges and 10 power levels. 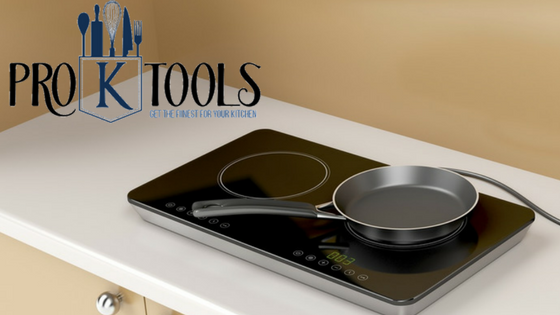 It features an easy to use digital control panel, and even if this will be your first induction cooktop, you will find very easy to use. The controls are few thus takes just a short time to learn them plus the digital contacts are very intuitive and well positioned. Also, this induction cooktop features a ceramic glass construction giving it a nice look while also making as well as resistant to scratches plus heat shock. The surface also features a guide to where you should place your pan or pot. Again, the ceramic glass surface is easy to clean. This is another lightweight induction cooktop burner with a three feet power cord and sturdy construction to easily handle big pots. With a hundred hours maximum cooking time, you can use it to cook just any food. It also features an easy to use digital control panel. The compact design means you only require a small space on your counter to place it on and you can use any induction cookware as long as you can see the unit’s corners, it has a 7 inches cooking surface. It allows finer temperature adjustments which are very handy when making certain foods. It is pretty fast, and you’ll have your water boiling within a few minutes. However, you must use a compatible cookware, and you can easily change from Fahrenheit to Celsius. It also has multiple stage programming plus the delay & sear function comes in handy. With this induction cooktop, you save up to 70% energy. This is another energy efficient and very affordable portable induction cooktop. It features an elegant design and will look good on your counter. It heats your cookware up faster hence saving you energy time and money. Again, with the polished crystal plate surface, this induction cooktop looks beautiful, and it is scratch-resistant. It also features five pre-programmed settings allowing you to easily cook different foods without wondering how to go about with settings. Also, it has plus (+) and minus (-) buttons to allow you to easily adjust the power, not the common on, off, high, medium, & low buttons. Cooking doesn’t have to take too much time, and you don’t need to have a large space to cook your own foods, thanks to portable induction cooktops. They are not only time saving but also energy and money saving units, and they are affordable. We hope this article makes your shopping easier.